Going into 2016, many technologists predicted it would be the year of the chatbot (dubbed “conversational commerce”), and in many respects the predictions came to pass. More than 30,000 branded chatbots and 6,000 voice-activated skills were brought to market. These chatbots serve numerous functions—from teaching a new language, to booking a flight, to ordering pizza or flowers, to managing your banking activities. The list of use cases could go on and on. Recognizing the business opportunities of chatbots, tech giants such as Facebook, Google, Microsoft, and IBM announced their entrance into aiding chatbot development. Each of them has rolled out respective APIs that allow developers to build chatbots on top of their messaging platforms. Once the biggest players entered the market, virtually every publication on Earth began covering the present and future of bots. Yet, despite all of this buzz, the short life span of chatbots left a gap between coverage and adoption. New technologies take the time to disrupt any industry or function. The opportunities for businesses to drive a competitive advantage with an enterprise-wide, multi-device chatbot strategy are vast and scattered across multiple industry segments, but because the door is open wide, it’s also been harder for the largest enterprises to pin down how to best use, develop, and deploy chatbots. Although fewer than one-quarter of consumers have heard of chatbots, products like Apple’s Siri, Amazon’s Alexa, Google’s Assistant, and Microsoft’s Cortana are helping to broaden virtual assistants to a wider audience, and a majority of consumers are open to giving them a try. Over one-third would be willing to make a purchase or receive product recommendations and support using a chatbot. 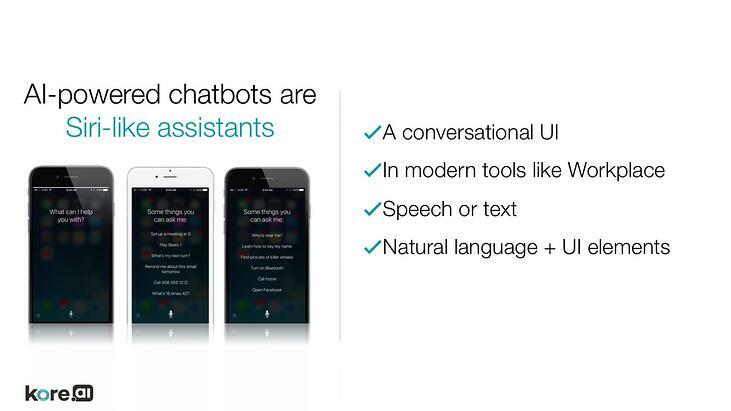 And these percentages are certain to increase as familiarity builds around chatbots. There is much optimism around the chatbot market, and early in 2017 the writing on the wall is that chatbots are more of a “when” not “if” proposition for the world’s largest brands and businesses. As social media platforms, which tout over two billion users worldwide, evolve from personal and corporate communications and information-sharing tools to advanced ecosystems for marketing and brand engagement, this will help fuel chatbot growth. Messaging apps offer an even bigger market opportunity than social media, with the top four messaging apps garnering over three billion users. It is easy to see why Infiniti Research, a market research firm, projects a 37-percent compound annual growth rate (CAGR) for chatbots through 2021. The “app-for-that” era is past its prime. The top 15 app publishers saw an average 20 percent decrease in downloads last year. It gets even worse; half of U.S. smartphone users didn’t download an app during a three-month time frame, and 13 percent of those who download apps account for more than 50 percent of all app downloads. You might be saying, “Well didn’t you just say messaging apps are booming?” Yes, we sure did and there’s a good reason for it. Messaging apps are stickier than mobile apps because the ecosystem created within them is evolving. System integrations are coming to live inside of messaging, so the more a user can do from one place, the more they will use that app. Messaging apps maintain a retention rate that is nearly double that of mobile apps, and they are used nine times a day—five times the average for mobile apps. There are simply too many apps out there, and users are overwhelmed with the number of apps that they need to download and use to communicate with all of the businesses that are out there. We’re beyond app fatigue; we’ve reached the point of app disillusionment. This year, most enterprises will dip more than just their toe in the water when it comes to chatbots. Most, if not all, recognize the limitations of apps in addressing the needs of their businesses—both with employees and customers. For early-adopting enterprises that have experimented with chatbots, they have done so by building them in silos. While this may work for an organization that needs a handful of chatbots, this strategy doesn’t align with the needs of an enterprise; it doesn’t scale, isn’t agile, and is cost-prohibitive. Additionally, chatbots must be readily available across any number of channels and integrate with business systems such as those used for customer relationship management (CRM) and supply chain management (SCM). The problem is, many chatbots are being designed to run in one channel such as Facebook Messenger or Kik and provide few, if any, API linkages with business systems. We’ve already covered a lot of ground, and we haven’t even talked about data protection! An enterprise chatbot strategy must address security issues. Advanced chatbots break down barriers between apps and data silos. This crisscrossing of systems and exchange of information creates cybersecurity and compliance concerns that make security a top priority when choosing a chatbot platform. Organizations need to know where the data is stored, who has access to it, and to what platforms it is communicated. The good news is, when it comes to building an enterprise chatbot strategy, organizations have several options. Single-task chatbot services are not suitable for enterprises that require automated workflows, integration with internal and external ecosystems, and sophisticated natural language processing (NLP). At the core of many chatbot services, are chatbot frameworks that provide developers with development structures from which they can build individual chatbots. Microsoft, Facebook, and other companies released their own frameworks with the intent of enabling developers to mass produce chatbots on their messaging platforms. One problem with frameworks is they’re a collection of separate tools and services. They largely focus on a limited number of consumer use cases, that developers can use to assemble a chatbot but they lack the end-to-end development and ongoing management capabilities. Seamless integration with internal and external ecosystems, chatbot connectors, and messaging middleware is increasingly difficult, and sometimes impossible depending on the vendor. Another potential setback when using frameworks include system integrator or consultant fees for piecing services together. The framework approach can mean each implementation is a custom build since there is no platform underneath. This means more time and more money to get to market. Frameworks can be helpful if the scope for a bot is small. If the scope and requirements are more demanding, a platform-as-a-service may be necessary. Chatbot platforms are more comprehensive alternatives to a framework, and allow enterprises to focus on building and delivering chatbots that address specific employee, partner, and customer needs rather than on how to develop a chatbot that aligns with specific requirements. The following are some of the core architectural requirements that enterprises need to ensure are baked into their chatbot platforms. Ideally you should have the ability to develop, build, and host chatbots that target a single role (e.g., allow customers to track their shipment orders) as well as create a multi-purpose chatbot that communicates with multiple systems and completes tasks in each of them (e.g., customer service virtual assistant). What can the bot do? Does the platform provide pre-built chatbots that address specific use cases (e.g., schedule a shipment) or the ability customize chatbots to handle multi-step workflows and processes (e.g., accept questions and find answers in a FAQ, documents, or websites). Can you enable users to leverage your chatbots in their channel of choice with UI elements customized for each channel (native SMS, email, social media, messenger apps) and the ability to interact with corporate tools like Skype, Kore.ai Messenger Platform, and Slack? You should also look for platforms where you can add the chatbots to your website, portals, and mobile apps. 4. NLP and Speech Recognition. Does the platform facilitate easy NLP training? Is it the training solely ML based? Are chatbots able to maintain accurate, content-rich, two-way conversations using text or speech? Chatbot platforms that combine fundamental meaning and ML deliver the most optimal results, recognizing intent and extracting entities to understand meaning. Tap an intelligence engine that understands, remembers, and learns from information gathered during each interaction. Includes the need to maintain the context of a user’s inquiry or request throughout a chat session and uses unsupervised and automated ML to perfect chatbot NLP. Does the platform facilitate messages between users, chatbots, and internal and external systems using a comprehensive middleware engine? Some core requirements should include capturing and storing messages sent to and from users, chatbots, and systems, automatically logging and categorizing message successes and failures, and processing user inputs from any channel. 7. Built-in Security, Compliance, and Controls. You’ll need a platform that conforms to federal industry regulations, helps you control user and administrator access, maintain transparent visibility and reporting across all chatbots, allow for two-factor authentication, and enable data archiving, retention, and eDiscovery, and enable end-to-end data encryption. What kind of tool us used to build the bots? Platforms should include an intuitive, web-based tool for designing and building chatbots in a consistent manner while customizing them based on use cases, tasks, channels, and security and compliance requirements, along with the option to start development process from scratch or reuse developed components. Look for the ability to test chatbot build throughout development. 9. Enterprise Experience and Focus. Look for a chatbot platform provider with substantial industry experience and focus. Getting started right out of the gate with the correct chatbot solution is important. Enterprises need to ask the right questions and determine what platform or framework can support their speed to market, scalability, and flexibility to support their large numbers of customers and employees. Kore.ai understands the complexity of enterprise requirements and built the Kore.ai Bots Platform for the enterprise. Our partnerships with companies like SAP are also focused on the enterprise segment. It’s all we know, and it’s all our customers know. There’s a difference between a true platform and chatbot frameworks or solutions comprised of piecemeal components from different vendors that are masquerading as a platform. Learn what those difference are here. Discover the ins and outs of the Kore.ai Chatbots Platform.